Tom was born in Harrisburg, Illinois on March 27, 1930 to the late Earl and Dena (Colbert) Hicks. He honorably served in the United States Army during the Korean Conflict and was privileged to participated in the 2016 Honor Flight. After 45 years of service he retired from CSX Railroad. Tom was a member of the Masonic Blue Lodge and volunteered at Deaconess Med-Wise Clinic, Deaconess Hospice and the Northpark Baptist Food Pantry. 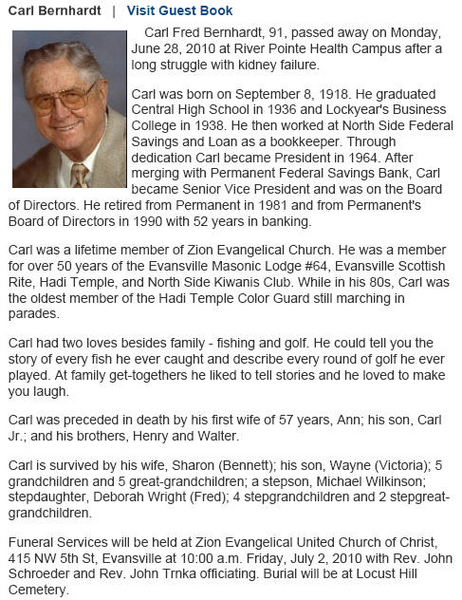 He enjoyed Western Movies, vegetable gardening, golfing and traveling cross country with his brother Norman "Bud". Tom had a sense of humor with great come backs and one liners, but his greatest joy was spending time with his grandchildren and great grandchildren. Tom is survived by his daughter, Susan Benjamin (Brian) of Carol Stream, IL; and his son, Keith Hicks (Cindy) of Evansville, IN; grandchildren, Bryan Hicks (Tammy), Kyle Hicks (fianc�, Rachel), Andrew "Drew" Hicks (Leann); great grandchildren, Hannah, Morgan, Emma and Whitney; a sister-in-law, Mona; his dear friend, Golden Koonce; and numerous nieces and nephews. Tom was preceded in death by his wife of 49 years, Betty (Johnson) Hicks; his parents; and siblings and their spouses, Lois McDaniel (Clarence), Norman Hicks (Wilma), Ershel Hicks (Olga), Kenneth Hicks and Lowell Hicks in infancy. Funeral services will be held at 10:00 AM on Thursday, April 25, 2019 at Browning Funeral Home, 738 Diamond Ave., Evansville, IN 47711 with Pastor Lynn Martin officiating. Burial will follow at Harrisburg City Cemetery in Harrisburg, Illinois. Friends may visit from 3:00 PM until 7:00 PM on Wednesday, April 24, 2019 at Browning Funeral Home and again from 9:00 AM until service time on Thursday. Memorial contributions may be made to the Honor Flight of Southern Indiana, P.O. Box 8234, Evansville, IN 47716. Wayne Topper answered his maker's call and laid down his working tools Friday, Jan 4, 2019. Wayne was 89 years old. 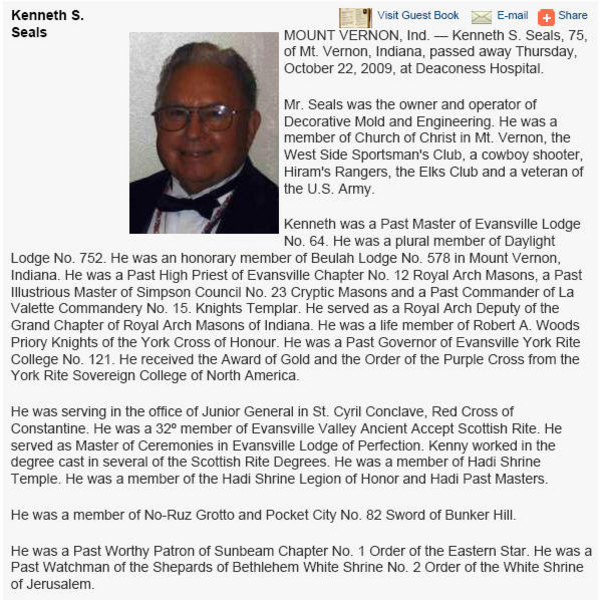 He was raised to the sublime degree of a Master Mason in 1951 and was two months shy of being a 68 year member. Yes, 68 years. 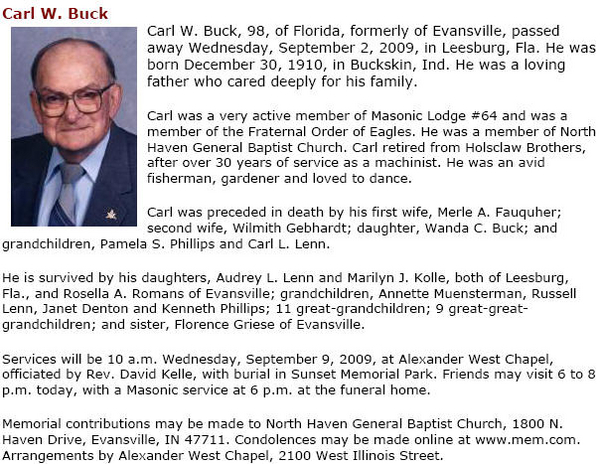 His surviving family has requested a Masonic Memorial Service to be performed tomorrow, Monday Jan 7 at 7:00 pm. The service will take place at Schneider Funeral Home 512 Main St Mt Vernon IN. Please attend to honor and respect your brother who has served so many years in our sacred fraternity. It is with sincere regret that I inform you of the passing of our Brother Alfred B. Cloum Past Master. Bud passed on Sunday November 6th. He was a Fifty year member having been raised in October of 1958. He served in the US Army during the Korean War. Bud was Master of our Lodge for the year 2013 which was the last year in which we met at the Temple on Chestnut St. He worked diligently on the reconstruction of the new Lodge building on Lafayette Ave. The family has forgone a Masonic Memorial service at this time. He will be missed and remembered by the many who had the pleasure of knowing and working with him in Lodge. Our sincere sympathy is extended to his family and friends. James H. Stines, 88 of Grand Island died Monday, January 26, 2015 at CHI Health-St. Francis. Celebration of life service will be 2 p.m. Saturday at the United Congregational Church. Reverend Lonnie Logan will officiate. Burial of ashes will be at a later date in the Westlawn Memorial Park Cemetery. Gathering of family and friends will be from 5-7 p.m. Friday at All Faiths Funeral Home. Mr. Stines was born September 29, 1926 in Dale, Indiana the son of Ernest and Anne (Howard) Stines. Those left to cherish his memory are his children and their spouses, Kenneth and Rhonda Stines of Liberty, Mo; Mark and Carol Stines of Grand Island; Jay and Loretta Stines of Aberdeen, SD; and his special friend and loving companion Alberta Perkins of Grand Island. Also surviving are his grandchildren and their spouses, Blaine and Lynnea Stines of Kansas City, Mo. ; Katie and Luke Hansen of Lincoln; Jacob and Toni Stines of Omaha; and Adam Stines currently serving in the US Navy. In addition, his legacy includes his great grandchildren, William Stines, Annie Stines, Cash Hansen and Holden Stines. He is preceded in death by his wife Dorothy and his parents. Jim was raised in Dale, Indiana where he graduated from Dale High School. He entered the United States Army on February 6, 1945 serving during WWII. He was honorably discharged on November 24, 1946. On September 6, 1947 he was united in marriage to Dorothy Kanzler. They lived in Evansville, IN, Chicago, IL, Fort Worth, TX, and Ogden, UT before moving to Grand Island. He was employed his entire adult life by Swift and Co. and then Monfort before retiring following over 40 years of service. 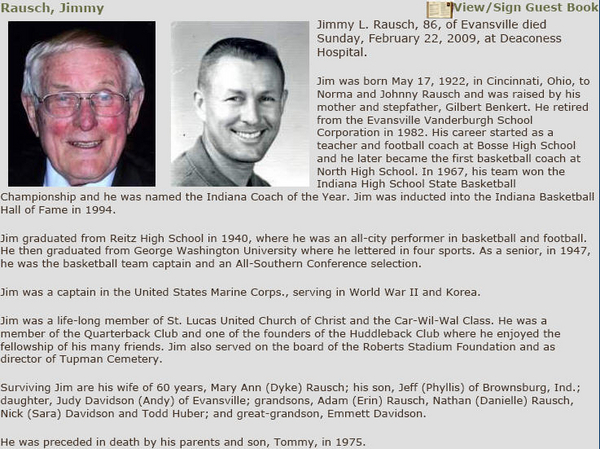 Jim was passionate about spending time with his children, grandchildren, and great grandchildren. 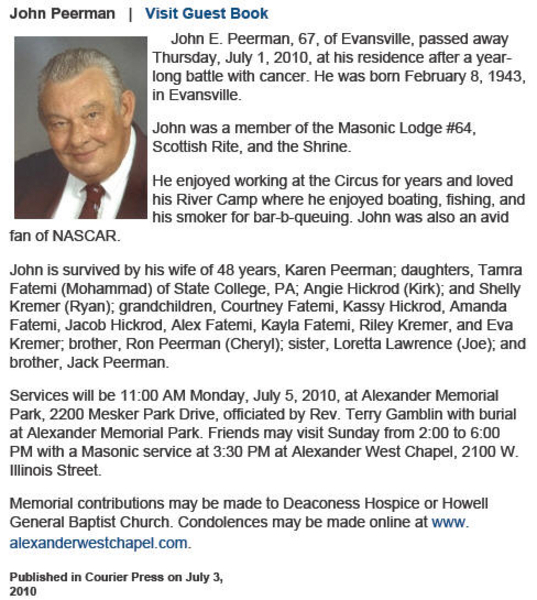 He was a golfing enthusiast and loved Nebraska football and Indiana Hoosier basketball. Memberships include the United Congregational Church, VFW and Masonic Lodge. Stanley W. Guth passed away April 7, 2014. 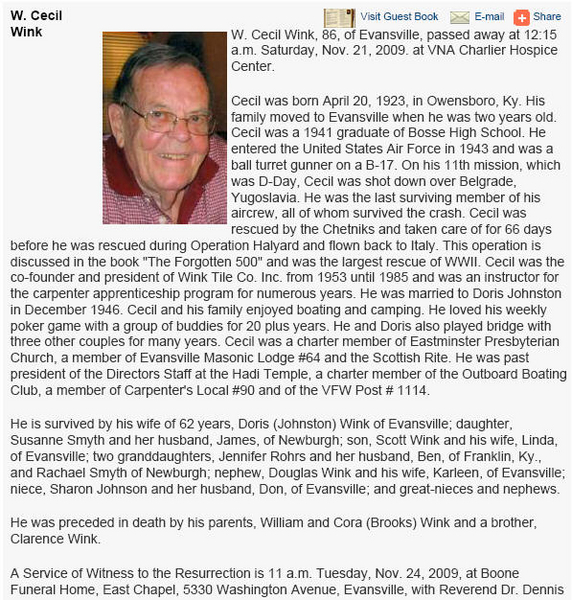 He was born April 28, 1920, the son of Louis and Matilda Guth of Mount Vernon, Indiana (Posey County). 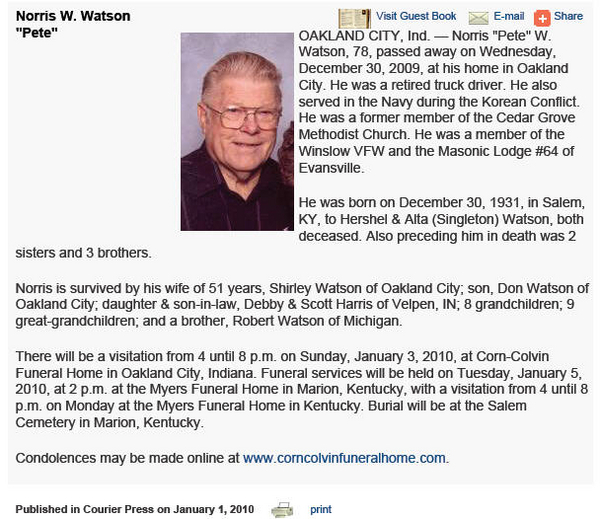 He was a 21 year veteran of the Indiana State Police Department serving as commander of the Evansville District, Seymour District and the Traffic and Inspection Division at General Headquarters in Indianapolis, where he organized and commanded the Department's Crowd and Riot Control Unit. He was the recipient of the Bronze Star Award for distinguished service to the Department and also named a Sagamore of the Wabash by Governors Matthew Welsh and Roger Brannigan. Mr. Guth served as a Major in World War II and commanded an Armored Division Artillery Unit in the Europeon theatre of operations. The Division liberated the Dachau concentration camp. Mr. Guth was the recipient of the Bronze Star. He also served in the Military Police Corp, Army Reserve. Upon retirement from the State Police Department he joined the Agency for International Development, US Department of State, serving as Chief of the Public Safety Department in the Philippines. Later he was transferred to Washington D.C. where he served as Chief of the East Asia Bureau. In Washington he also served as Chief of Operations for the Foreign Disaster Assistance program and later as Director of the program. Upon retirement he received the Outstanding Career Achievement Award for developing the US Government's International Assistance Programs. 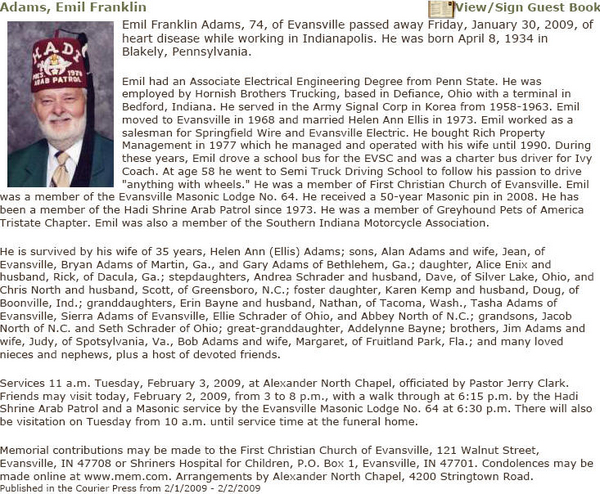 Mr. Guth was a member of Masonic Lodge #64 F and AM, Evansville, and the Scottish Rite, Indianapolis. He was also a member of the Veterans of Foreign Wars. Mr. Guth was preceded in death by his wife, the former Erma Lee Beaver of Evansville, IN; and a brother, Russell Guth. He is survived by his children, Kathryn Suzanne (John) Dixon and Cynthia Lee (William) Glander; grandchildren, Christopher Moon, David Glander, Benjamin Glander; and great grandchildren, Haley and Derek Moon. Also surviving are sisters, Valerie Strupp and Helen Kessler; and a brother Jerold Guth. William John Schlumpf Sr., 88, passed away on March 3, 2013. He was the son of Julius and Louise (both deceased) and the husband of Florence (Klueg) for 69 years. Bill was the father of William, Jr. "Billy", Julius "Bud" (deceased), Elizabeth "Betty" Newcomb and Barbara Cravens; father-in-law of Carol; brother of Catherine Lockyear; and grandfather, great-grandfather, and great-great-grandfather of many. Bill graduated from Central High School Class of 1943 and was a veteran of World War II. 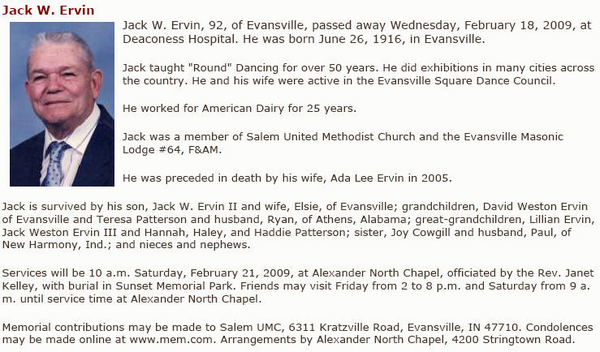 He was a Boy Scout leader, member of Hadi Shrine and Funsters, and member of Salem Church of Darmstadt. He enjoyed Lake Barkley, fishing and stock car racing. At his request, there will be no visitation or service. Donations may be made in his memory to the Hadi Shrine Hospital Fund or to Salem Church of Darmstadt. Sunset Funeral Home is handling arrangements.